Residents of a neighbourhood rocked by a home explosion held a private memorial service on Saturday. The blast shook Sprucedale Crescent nearly a month ago. Edra Haan lived in the home, and was found dead after the explosion. Her death is being treated as a homicide. Her husband, Udo Haan, was left in critical condition. 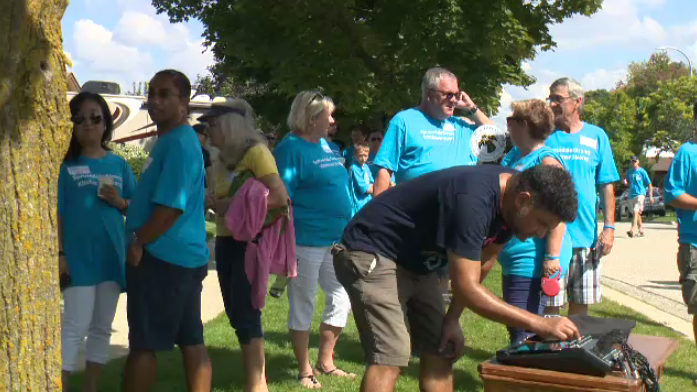 Neighbours came together to hold the service on Saturday afternoon, unveiling new benches for the street in an effort to bring the community together. Kids’ games were set up as residents sang songs and spent time together reflecting. Residents of Sprucedale Crescent at a memorial after a home exploded on their street.